Post subject: The TM ANH facemask and the C-scar. I would like to open this thread for open, friendly discussion on the C-scar. I have no interest in popular prop politics over this matter, and so I ask that, if at all possible, we focus strictly on academic discussion. 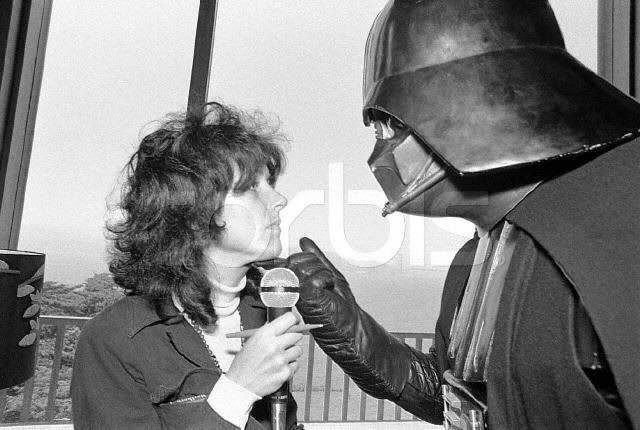 I know this will be a challenge because anything I've said so far on the matter on another board has been vilified and accused of sinister motivation, but I feel it's about time to discuss a closely guarded truth about the screenused ANH Vader mask, and perhaps the community can heal from this unnecessary division just a little. One of the reasons why this has not been widely known is, basically, unavailability. 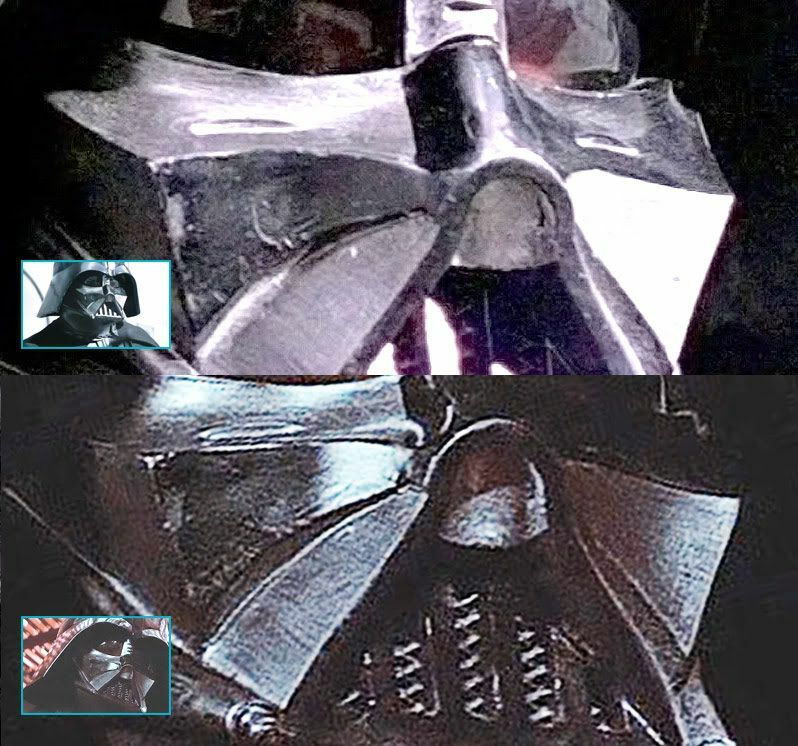 There were two (official) or more molds (perhaps official or unofficial) taken off of the original screen-used ANH Vader at different stages of its tenure - a UK mold (from which the actual production masks for ESB and ROTJ came), and a US mold (which provided the tour and promotional helmets). As I'm writing this quickly from memory, if I make mistakes, send me a PM instead of replying, so I can edit Post #1 of this thread so that people don't have to scroll down to read any corrections. It is important to note that there are differences between the US and UK mold. They were taken at different stages of the mask's existence. The UK mold was taken towards or at the end of the production of ANH, where all the glorious details of this scene can be seen - dings, paint drips, hairline-thin phenomenon - right down to the very paint brush strokes. The famous Tantive IV scene (click on the above thumbnail) was filmed, ironically, at the end of the production, even though it was at the beginning. The TM facemask is dubbed by owners "TM ANH" because (1) the chin triangle is the original-sized small ANH configuration) and (2) it reflects the plethora of splendid detail. The US mold - now more known as the "Rick Baker Mold" - is different. There are structural characteristics that distinguish it from the UK-mold descended screen-used production masks. 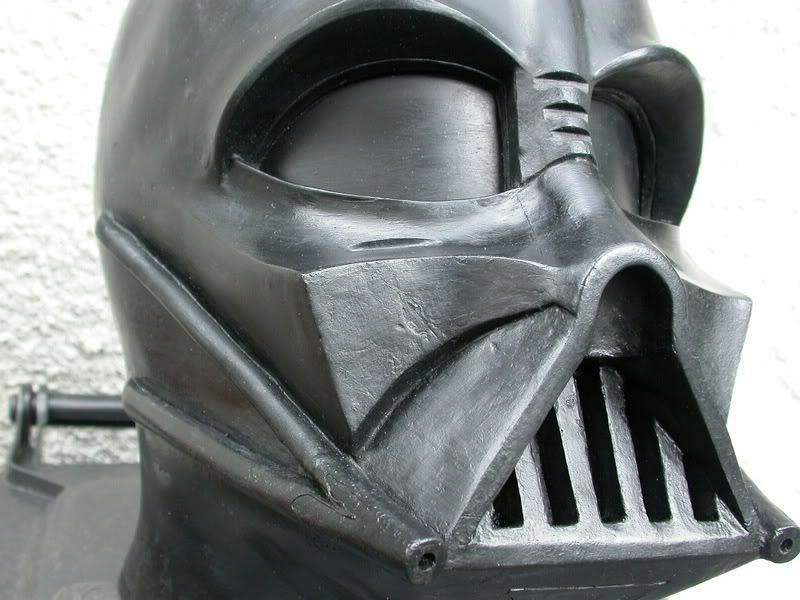 It is believed to have been made at a time when the screen-used ANH Vader had been cleaned up. We do know that when Kermit Eller was touring with the screen-used suit, there is photographic evidence of surface dings and details such as the "C-scar". Photographic evidence includes the Don Post Studios outdoor photos as well as the Corbis tour photos. There was a point in time, however, that the screen-used itself may have been repainted. Vader had a more pristine appearance seen in "Chronicles", at the Chinese theater, and other public venues. (Above: a Chinese theater appearance with a more pristine paint job). If indeed the Chronicles is *THE* screen-used that had been repainted, you will note from the Chronicles shots that some of the textural detail is gone due to the new paint work. However, given the film grain and loss of detail, some detail may simply not showing up due to the sensitivity of the silver-halide film. There may be some who doubt that this is THE screen-used and is, instead, a copy. If a copy, then comes the question whether the copy was from the US (tour) or UK (production) mold, as the structural characteristics of the Chronicles mask that do not appear on masks that come from the US (tour) mold, which would indicate the Chronicles mask is not a tour copy but the original. However, that discussion is for another time, as this is just an intro. What is the "C" scar? I called it a "C" scar because it roughly looks like a letter "C" depending upon how that structure is catching lighting. It is structurally like a ledge or cliff (think topological geography). Depending on the light direction and how much light it manages to pick up, camera angle, etc., it could be interpreted as a "J" or even an "S". The erroneous assumption is that it was a painted detail. If so, that makes no sense. 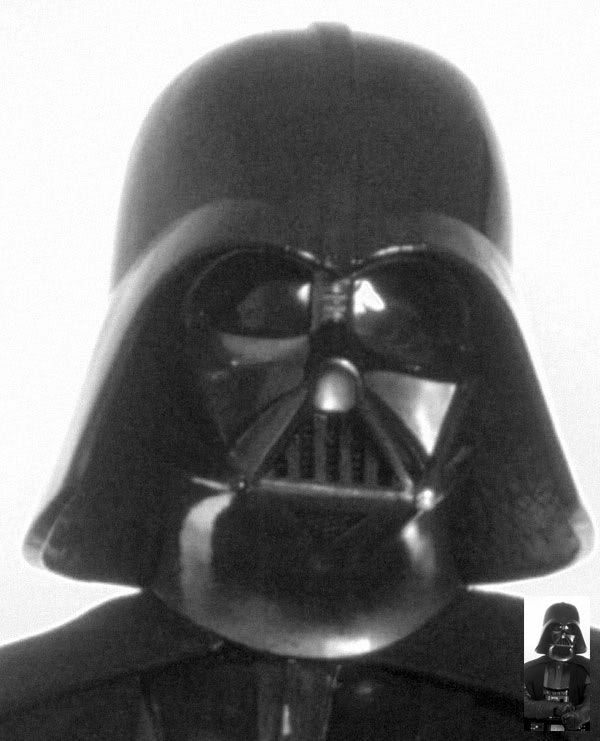 First, the ANH Vader mask was originally completely black. 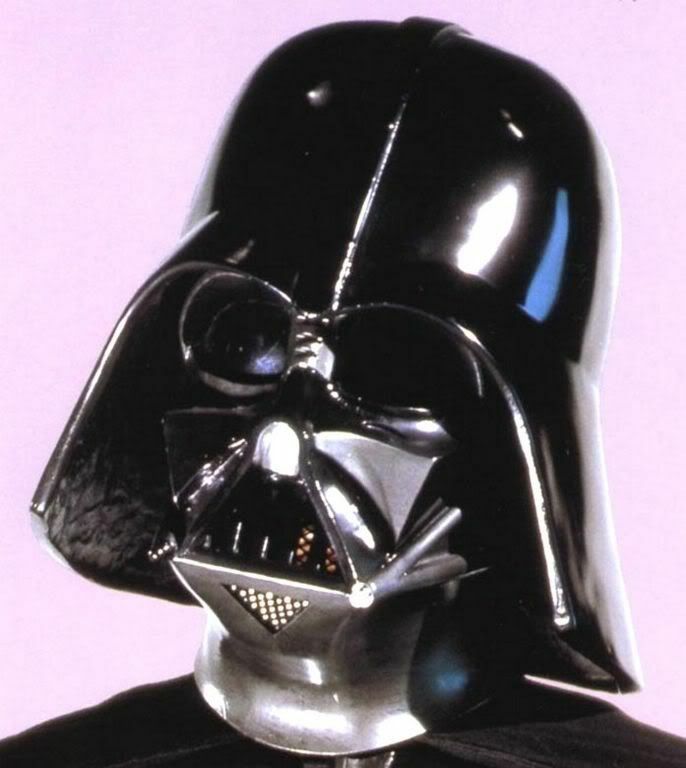 When it was determined by the film crew that the pitch-black mask's surface details were not getting picked up, it was decided to have alternating facets of Vader's face painted with metallic gray. Most viewers regarded these as light reflections and never noticed they were "helped" by brighter paint. The metallic gray paint was done as a rush job. 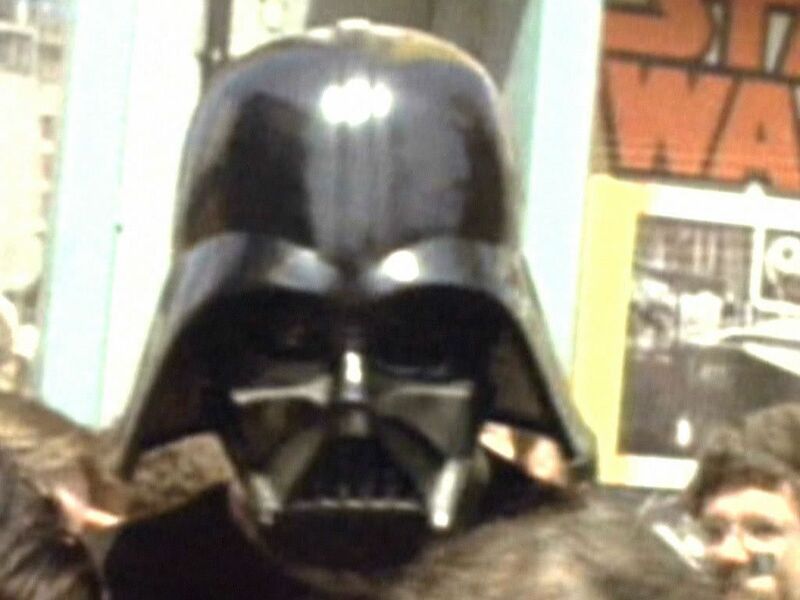 Although Lucas did call for a lived-in look and there was intentional weathering done to the mask, the actual weathering was sparse throughout the costume. You can see paint drips on the original, evidenced by paint drips on the TM in correlating positions. Props back in that day were not always done to pristine fashion. Most of the time, the characters are moving, and usually people are shocked at all the imperfections when they manage to see the actual prop in person. 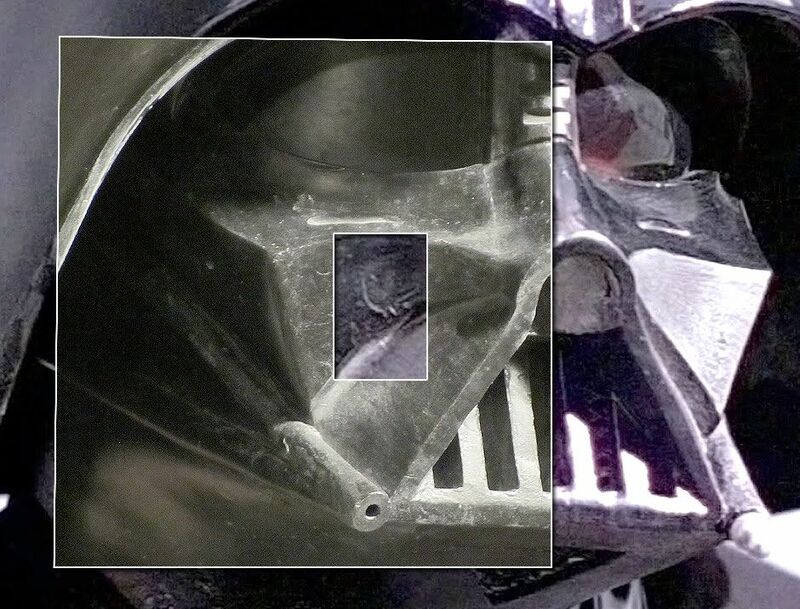 If the purpose of the paint was primarily to make the facial surfaces more visible to the camera, and that most people seeing Star Wars for the first time in 1977 barely noticed the paint brush strokes, is there any logic to the supposition that the "C" scar was painted with metallic gray paint? Is such a supposition supported by any photos or screenshots? The "C" scar nature has to be understood from the perspective of how lighting direction can affect how you study mountain formations in topographical photos. The illumination of light or the darkening by shadows cast by objects can cause people to misinterpret what they are seeing (e.g. the famous "Mars Face" photos). Here is how the C-scar compares against the screen-used. Here is pic of my TM of that area of the faceplate, positioned over a screen capture of the original. It's not a perfect overlay. I'm using a $250 consumer camera lens that is hardly the same caliber, diameter and quality as the original Panavision camera and therefore I cannot match a full-face overlay perfectly due to the different lenses handling close-distance perspective distortion differently. So there we go! Let the friendly discussions begin! Wow, no need for a thread now, those 3 pix tell all. Nuff said on the C-scar! Well done Mac! Dumb question. Are the brush strokes cast on this helmet? The TM does indeed capture the paint brush strokes. It's actually quite amazing. You can see them each and correlate them with the ones on the screen. What i don't understand in the TM pic is whether or not the paint was stripped as I see paint strokes. The main problem I have is if it was stripped of it's CURRENT paint the casting itself is still off of the painted ANH screen used so the paint strokes and layers of paint would be built in to it's mold already. It wouldn't matter if you stripped the paint off the TM casting. It would only matter if the paint had been stripped from the screen used helmet PRIOR to the UK mold from which the TM is derived from. The paint layers would then become part of the mold which is not indicative of the helmet PRIOR to painting. Viewing a cast of a painted sculpt does not show you the details of the actual sculpt unpainted. Does that make sense to you guys? What is going on where the cheek with the C scar meets the nose? My view would be that the c-shape is not sculpted into the mask itself but a result of a lot of paint that gives it dimensionality as the paint was thick and raises up just like paint on a canvas. My next question is to whether the RB mold is actually taken from the screen used helmet or a cleaner extra casting made for production in which case it is accurate and you would then have to apply the excessive paint to recreate the film used look to give it that depth in the paint layer. If you look at the large pic originaly posted by Trap Joe, you can see the line where the black on the top of the nose stops, and where the gunmetal begins..very cool! Excellent observation. 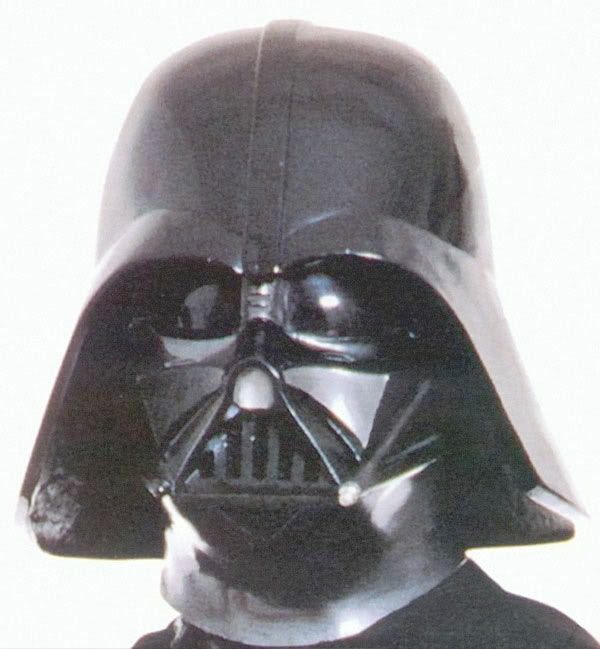 If you refer to the "TM ESB Vader Helmet" article - the-tm-esb-vader-helmet-vt1654.html - the mask had been painted. The paint was removed by acetone, revealing a lot of slapped-on resin. The resin was removed revealing even further detail. So the paint brush you see in the TM are not paint but inherited from the mold. The paint of the screen used was not stripped at the time the UK mold was made - they just molded the painted helmet. Hope I understood you right. Exactly, which leads me to believe the actual Vader helmet sculpture had a clean and smooth cheek, but after it was painted the paint itself gave it a depth from the paint being smudged. So the screen used version would have a raised paint c-scar but the actual UNPAINTED original casting would not. 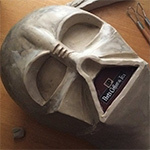 To actually recreate the vader lid you would need a clean casting and add lots of ugly paint to it with a possible thumb indent in to mush the paint. Same thing kept happening to me when i painted my baseboards. The original screen used cast was clean and sharp. All the damage, dings and dents and paint drips happened when painting it and during filming. You would not be able to recreate all the details of the screen used ANH at the Tantive scenes if you started out with a clean casting - too many have tried. The only way to recreate all that is to have a cast WITH all those details cast into it that you can then paint after to get the details right. Last edited by No Humor Man on Sat Apr 30, 2011 9:55 pm, edited 1 time in total. Yes! Brian Muir sculpted this smooth in clay first. A mold was done, and then a plaster casting produced. He then went to sand and refine the plaster master before a new mold was made to produce the three known production masks. The C-scar was not intended by design, and does not exist in the John Mollo artwork. There is some discussion beyond my expertise of Prowse's face (mask) being struck by Alec Guiness during the Death Star hallway fencing scenes. I don't keep track of production history. But anything could have caused it - from someone dropping car keys onto it to a stunt saber hitting the face and chipping off some of the paint layers. It could have been caused by accident - or stupidity. B) a casting with the paint embedded into it which means you would have to give it a super light coat of paint otherwise you would wash the detail away as a new paint layer would smooth it out. I still don;t see how this makes the RB mold incorrect if they had possibly tried to smooth that out to remove the accidental lightsaber ding that shouldn't have been there to restore it to day 1 filming appearance. Or again, did they either A) recast the original sculpt or B) recast an unused lid without paint? It's possible to paint these helmets with all these details without obscuring them. Just look at the eFX Legend. Lots of detail still showing. For both UK and US molds they molded THE original screen used helmet at different times. And yes, it is believe by some that Baker restored the face mask back to a more pristine look regarding a few sections of damage, but otherwise left most of the rest intact, only giving some areas a light repaint, before molding. If that's the case why is there such a big fuss over 1 possible corrected chip in the paint? Especially when a TM is not available for the rest of us? It's not like there's a choice to make when purchasing. Right now the eFX is the only one from an original mold available. Unless someone wants to offer me a TM I only have 1 real option out there for ANH.